Spring reminds us of new beginnings and plans for the year ahead. With it comes the imagery of chicks and bunnies, eggs and flowers, which heralds the start of Easter. These images, which embody ideas of rebirth, are not just attached to the Christian festivities of Easter; they are formed from ancient beliefs and mythology, including the celebration of the pagan goddess Eostre. The name Eostre derives from Northumberland Old English and was first identified in Bede’s work, De temporum ratione, written in the 8th century AD. The mythology goes back much further to pre-Christian times and, aside from the similarities in name, the themes of Easter can also be traced to these pagan beliefs. 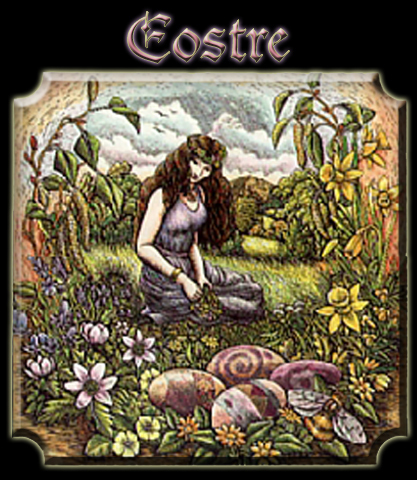 Eostre was regarded as a goddess of fertility and has been associated with the Northern European Saxons, though there are variations of her name as she was adopted by different pagan civilisations. Today, Wiccans and Neo-pagans recognise Eostre in the form of Ostara, from Old German, and they celebrate Ostara, the start of the zodiacal year, as one of their eight annual Sabbats. Ostara occurs at the spring equinox, which falls around the same time as Christian Easter festivities, and celebrates the planting of seeds and the return of fertility to the land after the darkness of winter. Eostre’s association with renewed life means that she has been characterised as bringing light, with her name suggestive of the sun rising in the east. Commenting on an entry he had read for Eostre in a dictionary of etymology, John Andrew Boyle described how she was supposedly imagined as surrounded by lights which were held up by hares. Hares and rabbits are appropriate symbols for new life because they sleep longer throughout winter and tend to mate in spring. Some commentators have also been tempted to link Eostre with the Norse goddess of love and fertility, Freyja, who was said to have ridden in a chariot pulled by cats. As John Andrew Boyle states, the idea of cats and hares are seen as synonymous with witch familiars in Wiccan and Neo-pagan beliefs, and it is sometimes thought that the hare was Eostre’s incarnation. Today we see these representations of the hare and light in the modern festivities of Easter: the Easter bunny brings eggs, which are symbols of fertility, and the longer hours of daylight brings life to crops, flowers and animals. The Eostre figure is common across many belief systems, with several goddesses of fertility and rebirth found in the ancient pantheon of gods and goddesses. Among those most familiar to us today are Aphrodite, Demeter, Cybele and Ostara. As well as the similarities with ancient myths, the pagan belief in Eostre also ties in with the Christian belief in Jesus. At Easter Christians celebrate the sacrifice and resurrection of Christ as a powerful cyclical motif of the promise of life after death. One origin of this concept can be seen in Greek mythology with Cybele, the Great Mother goddess, who desired Attis. Attis, like Jesus, was said to be born to a virgin mother during winter and died and was resurrected around the spring equinox. It has been suggested that, as pagan spiritual beliefs pre-existed the Christian faith, many pagan rituals were transposed onto Christian belief during the pagan conversion to Christianity. While it is difficult for us to be sure of the origins of particular beliefs, it seems clear that there are dominant themes which remain throughout certain festivals. Nowhere is this more obvious than the ways in which Easter and Eostre celebrate the positive regeneration of life. Do you still have any faith or time for Eostre? What about Easter? What does Easter mean to you?